Patriot assistant Tony Wright has been promoted to head football coach at Cousino. Wright has also been an assistant at Warren Mott and Sterling Heights. Former coach Brad Nettles stepped down earlier this month. “I’m excited and grateful ” said Wright. We at Macomb Varsity have known Wright from the beginning of his career and believe this is a tremendous hire for the Patriots. Good Luck Cousino Head Football Coach Tony Wright. Three Macomb area football teams made it to the state championship games. We hope you all had a great Thanksgiving Holiday. Here is a look at the match ups and the pics. Pic Chippewa Valley -1.5 over Clarkston. 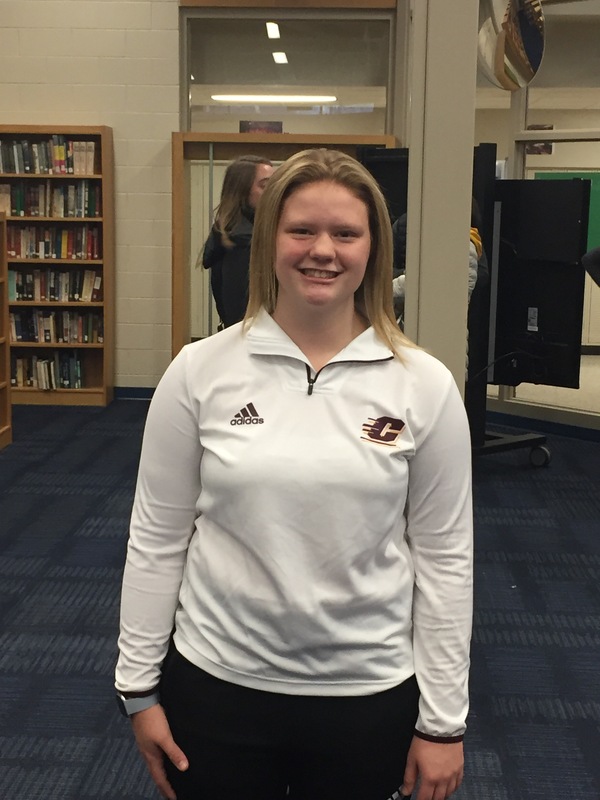 Cousino Lady Patriot Guard Kate McArthur has signed to play at Central Michigan University next season. In a preseason poll McArthur was rated among one of the top 50 guards in the country. McArthur signed with CMU at Cousino in a ceremony held this afternoon with many people in attendance which included, family, friends, teammates and media. Cousino Athletic Director Aaron Setlak said “Kate is a great student and person and comes from an awesome family”. Incoming head coach Amy Mitchell praised McArthur . She’s a great player, but more importantly I’m really impressed with her maturity” said Mitchell. Former head coach Mike Lee said “It was a tremendous ride with Kate and I wish her all the best”. When asked about why she chose CMU McArthur said ” I really like the campus and being close to home”. “Family is very important. My mom and dad have done so much for me” added McArthur. Our team goal is to win a another state championship. ” I want to go out the way I came in, winning a state title”. ” I know it will be a special season” concluded McArthur. This weekend is semi final Saturday and we have four teams from the Macomb area still alive. Congratulations to all of our teams on a great season! Roseville back Martell Turner scored on a 89 yard touchdown run on the first play of the game, but it would be Lakeview that would score the games next three touchdowns on their way to a 41-32 victory over the Panthers Friday Night. Ivan Krohta ran for two touchdowns and passed for another and Evan Rochon rushed for 217 yards and also ran for two scores. Terrence Weathers of Roseville returned an interception for a touchdown that would cut the Lakeview lead to 21-20 just before halftime. 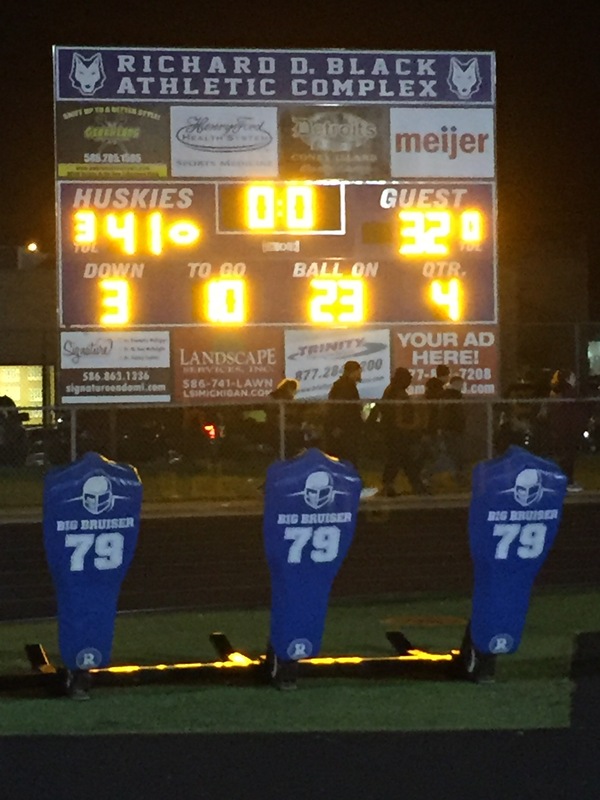 With Lakeview up 34-32 Rochon would score from 22 yards out to clinch the victory for the Huskies who now move on to play Port Huron Northern for the district championship at Northern next Friday night. “I told our kids at the half we might be in a one point ball game, but we’ve been here all year so it’s nothing new , let’s go out and take care of business and they did” added Threet. “Evan and Ivan are great competitors and give it all they have every week” I’m very proud of our entire team” concluded Threet. “This team plays hard and when one guy goes down everybody steps up. Ivan got hurt, but our team rallied together and played very well tonight”said Rochon.